"I wonder if we should be doing something a little more important on this day that brought such hope and optimism to the country 10 years ago." 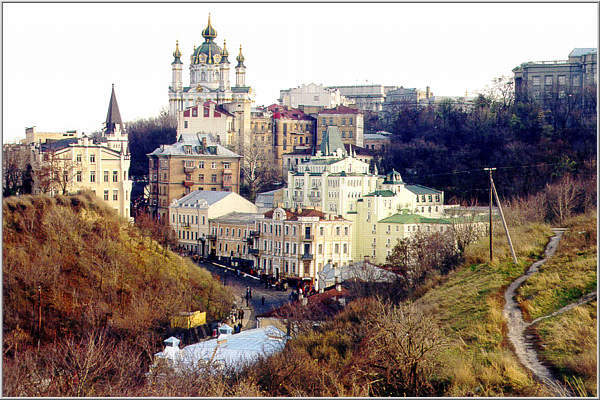 SELESHCHINA, Ukraine --- The fall of the Soviet Union changed the way the world works from Beijing to the Beltway. It didn't, however, change the way Luda works in this quiet village of 5,000, where the cows still walk down the main street unescorted every morning to graze. Well, maybe things are a little worse, she says, since they lifted price controls and the cost of food soared. Luda survived the economic collapse of the past decade the same way many other Ukrainians did --- thanks to her garden plot. Today seems like just another day for Luda. She rose at 5 a.m. for the chores that keep her family fed. Gathering eggs. Milking cows. Bringing in water from the well. Except today she won't go work as a nurse because it's not just another day. At least not to me. Ten years ago today, the Supreme Rada declared independence in Ukraine shortly after the failed Soviet coup. Ten years ago, 84 percent of voters thought statehood would bring political freedoms and economic prosperity. This day, I think, is everything the Peace Corps recruiter was talking about when she offered the chance to work in a country "at a critical juncture in its young history." But that hope and optimism of 10 years ago has faded as the work of building a democratic nation turned out to be slower than expected. For Luda, at least, the day is cause for celebration simply because her three sons are home. Nothing more. Her oldest son mentions it's convenient the holiday comes in August because it gives everyone an extra day to dig up potatoes. That's why I'm here. I wanted to celebrate this historic day in true Ukrainian style. Whatever that is. Not even the Ukrainians know. So I asked Svieta, the English teacher at the school I work at, to let me tag along to her in-laws so I could find out. It's such a new holiday, she said, we don't have any traditions. Maybe one day Ehor will have his own traditions. Ehor is Svieta's 7-year-old son who is outside chasing butterflies. For five years after the Chernobyl disaster, Ukrainians tell me, there were no butterflies. Inside, Luda is preparing the first of what will be three meals of mashed potatoes. The youngest son returns from the outhouse, and an argument breaks out about a new gadget he bought. A mobile phone. This is when I learn the word "unnecessary." The parents take a break from scolding their grown son and look at me embarrassed until I assure them it makes me feel right at home. But there really isn't time for arguments. The so-called kitchen garden is bigger than I expected. A lot bigger. The family chats about the village gossip as they work together on the potatoes. The men dig. The women gather. My friend the English teacher asks me the word for "the thing you use to cut grass." A lawn mower, I say confidently, until I realize she was talking about a sickle. In Kiev, the family tells me, there are fireworks and parades. The long-standing tradition of completing construction in time for an anniversary was preserved --- a new monument and remodeled train station in the country's capital. The family works on. They point out a bug called "kapustyanka" and tell me it's also the name of someone who lives in the village. Everyone laughs. I ask what the holiday means to everyone. The answers reflect the same combination of desperation and hope of the country's national anthem, "Ukraine Has Not Yet Died." I want to go to America, Luda says, where things are better. You should love your country because it is your motherland, her daughter-in-law tells her gently. There is nothing to love, Luda answers firmly, and the conversation ends. They aren't avoiding my questions. The topic simply doesn't interest this family. The differences between Ukrainian moonshine and the American version is another story. I mention that while Ukrainians use sugar, Americans use corn. They don't believe me when I tell them I've never made it, I just happen to know. They want a recipe. The youngest son asks for the sixth time if I am tired of gathering potatoes. I lose patience. "Do you think Americans get tired faster than Ukrainians?" I ask. Americans don't work, they cheat, he tells me. I don't know if he learned this during his Soviet education or if it's a harmless joke. Either way, I work faster and harder. Fill the bucket with potatoes. Dump them in the giant bags. Repeat. The sorting will be later. I work as if I can change the minds of every Ukrainian citizen. But the truth is, I'm exhausted. I ponder bringing up the mobile phone in front of his parents to retaliate. Since my job is to bring "peace," I reluctantly decide against it. The last row of potatoes finally arrives. We walk back to the house down the main street. There are no flags of blue and gold waving in the breeze. I didn't exactly expect a giant clothing retailer to mass produce shirts, but I did think the day might be, well, somehow more historic. Then we stroll past the new cafe in town. A sign reads "this cafe is dedicated to 10th anniversary of Ukraine's independence." It's not state run, the teacher tells me. It is his very own, and he is proud to be Ukrainian. Fighting the bureaucracy and corruption to open the cafe undoubtedly took the kind of preservence that comes from centuries of hardship the Ukrainians have endured. A Coke at the cafe was the best I've ever had. After the rest, the time came to gather fish for dinner. We sit by the pond as the three sons work. I wonder if the sky is as blue anywhere else in the world, the teacher says. She wouldn't know. Virtually no foreign travel was allowed during Soviet times. Now it's the economy that prohibits it. Luda's husband asks me about the retirement age in America. Tomorrow, he will go back to work at the collective farm. It isn't a collective farm anymore because a private company bought it up, but that's what everyone still calls it. The work certainly hasn't changed. He looks tired, but he has plenty of energy when his grandson Ehor plops down in his lap. Back at the house, I bring out a Frisbee. Ehor grabs the "flying Ukrainian plate" and starts showing off to his friends, ordering them exactly where to stand and how to throw it. He may be president one day, I tell his mother. And it's true. For all of Ukraine's problems, mayors, lawmakers and the president are now elected by a free vote. When it gets dark, I bring out the Uno cards. Ehor helps me explain to his grandfather the difference between a "draw four" and a "wild." I wonder for a second if we should be doing something a little more important on this day that brought such hope and optimism to the country 10 years ago. Then I realize, maybe, just maybe, we are doing something important. We just spent a day building Independence Day traditions for Ehor. I think about the national anthem again. Especially the line "Luck will still smile on us brother-Ukrainians." For Ehor's sake, I hope it's true.